This month, we look at important changes happening in the Old School version of the game and a few other BORING articles. The undisputed greatest topic in the history of mankind and extraterrestrialkind appeared this month, in which Supersal69 posted a photo of her frying pan making a face out of cooking oil. Anybody who was not present for such a momentous event should truly be pitied. The infamous Internet argument concerning a dress inevitably appeared on Sal's this month in the form of a status update by Kesthetic. This particular discussion was unfortunately void of the standard "uh-huh" and "nuh-uh" associated with the matter in question, especially as half the public opted in favor of unusual colors such as maroon and orange. Forum member and incendiary Shooter585 posted the laconically-titled topic Who would win, asking the public whether a bear or a pack of wolves would win in a fight. The poll votes have proven fairly even, and in the topic, Yuanrang serves as representative of the bear party, with Micael Fatia in the wolf pack. A consensus will surely come soon, because this is the Internet. Lava Whip - Has a special attack that can drag your opponent next to you. Has no offhand version. Staff of Darkness - A special attack that absorbs and reflects 25% of damage for 20 seconds. Strykebow - A shieldbow that has a passive ability that stores damage and then releases it every 5 auto attacks or 15 abilities. Also has a special attack that releases stored damage. 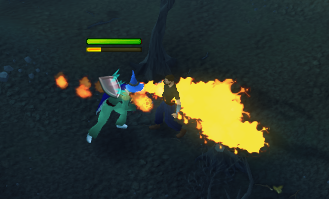 The wyrms also drop the best ashes in the game prayer XP wise and a high healing fury shark, which heals 2475 damage in combat and 2800 outside of combat. This is hopefully a precursor to more wilderness updates, as the area does not get much love. On February 19th, permanent freeplay was introduced to Old School RuneScape. The move, which was voted in alongside bonds, has re-popularized several freeplay areas, such as the Varrock wilderness. A week later, the Grand Exchange was introduced. The Old School Grand Exchange works similarly to the original Grand Exchange found in RS3 and is located in the same area (northwest of Varrock). Thanks to the release of freeplay Old School RuneScape and a slightly growing RS3 game, the player count is higher now than it has been since the release of Old School RuneScape. Player count regularly is above 100,000, which is something many people thought they would never see again. On February 22nd, player count exceeded 120,000. This player count, which is reminiscent of the "old days," has generally increased morale around the game. Between February 19th and February 23rd, over a 72 hour period, all experience gained was doubled. To celebrate (and get competitive!) we held a competition to see who could rake in the most experience over this time period. Unfortunately our tracker crashed towards the end of the competition, so we don't know the exact experience everybody got. However, we know ballpark figures. Angel Hayley won the competition with over 98,000,000 experience. This is by far the most experience anyone has gained in one of our competitions. Hayley gained most of the experience through Summoning, and received the level 120 true mastery cape during the competition. In second place was Jj Dynomite with over 34,000,000 experience, mainly through Hunter and Thieving. Who was third can be disputed, but it's likely that -Leaf- claimed the bronze with over 18,000,000 experience. The competition helped motivate players to make as much use of their time as possible. Fun was had by all! This newsletter was posted late (on what would be the first of March if February was 30 days long) in retaliation against the nonsensicality of the distribution of days throughout the Gregorian calendar. (The pronunciation of February is a subject for another time.) Thus, we are in the process of forming a petition to Pope Gregory XIII to shift two leftover days from months with 31 days to February, and to change the additional leap-year day to June so that summer vacation seems longer. However, a petition of such grand scale would require large funding for server expenses, so we are in the process of forming a petition to create said petition. Note: This is not a serious article and we don't suggest you try this at home. A frequent question the Santafish Monthly staff get asked is "What is something that I have learned from RuneScape that I can apply into the real world?" It's a valid question, and brings up a few inevitable responses: Iron + Coal = Steel, knowledge of medieval weaponry, characters of Slavic Folklore. That's all nice, but it's completely pointless to the lives of the average RuneScaper. However, there are a few things in RuneScape that can be readily applicable in the real world. Today, we will be learning something that could be very important in life or death situations: self-defense. You see, some combat abilities can be performed in times of need, and I'm not talking about something as simple as kick or back-hand. Let's set up the situation: you're in a dark alley and a white, heterosexual male (he can't be anything else for political correctness reasons) comes up to you wielding a knife. You can't run as there is a brick wall to your back. It's you versus him. What are you going to do? It's simple: cast the Dragonbreath ability! 1. A source of fuel. There are various types of fuels out there. There are traditional fire breathing fuels, but you could also go for something like corn starch. It's also possible (but more difficult) to use hard alcohol, and I know personally that (assuming I'm the archetypal RuneScape player) everyone carries around a bottle of fireball whiskey wherever they go. 2. A flame source. The bigger the better; otherwise, you could accidentally blow your flame out, which would be painfully embarrassing in front of the thug. However, you may have no choice but to use a lighter. A match could be problematic considering you could burn your hand. When you're ready, place a bunch of fuel in your mouth and get your lighter ready. Make sure you're standing correctly towards the thug. We don't want you burning off your face or your clothes! When you're in firing range, light your fire source, place it in front of you and blow out the fuel. That thug will have had no idea what hit him! After you're done taking him to combat triangle school, you can get on with your day. Last year's March newsletter described a super duper spectaculabulous fact about the month March: Each day of the month can be grammatically construed as an imperative command, such as, "March seventh." This applies twofold to March 4th, which can additionally be written as, "March forth." What we didn't realize last year was that, for this reason, March 4th is National Grammar Day! You can tell by how extensive the Wikipedia page is that it's a truly significant event! In celebration, be sure to verse yourself on the difference between various homphones, indoctrinate your friends with the Oxford comma, and argue with your American/British compatriots about which style is superior! In this section, we thought we'd comment on a nickname (given by Old School players) for RuneScape 3: "EZscape." Given the fact that there are fast(er) training methods and bonus XP, this may be a valid name. But for the sake of creating something interesting to read (WE'RE TRYING GOSH), I thought we'd change the scenarios up a bit. And the list goes on and on. The point? Although it is true that RuneScape 3 is less time consuming than Old School RuneScape, they should not call RuneScape 3 easy without realizing that relative to RuneScape Classic, Old School RuneScape is also very easy. What is the difference between Inlaws and Outlaws?